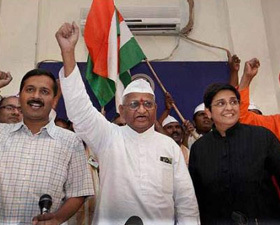 Anna Hazare's team that has also included two former bureaucrats, 1972 batch IPS Kiran Bedi and 1995 batch Indian Revenue Service officer Arvind Kejriwal, has chosen to term the government version of Lokpal draft as ‘Protection of Corrupt Public Servants Bill, 2011’. Anna Hazare and his core team have been ridiculing the government’s version of the draft as Jokepal after the Union government chose to ignore the civil society’s version of the draft bill and introduced its own version in Parliament to decide. Now, a standing committee is scrutinizing the merits and demerits of the draft Bill. On Tuesday morning, Delhi police detained Anna, Bedi, Kejriwal and advocate Prashant Bhushan among others for their proposed plan to protest without getting requisite permission. There was an apprehension that the protests would disrupt normal life in India’s capital city. But many common men were annoyed to witness Delhi police’s crackdown on Anna Hazare. Bhushan has been arguing in news channels that government’s Lokpal Bill would in fact shield corrupt officials. Here is his argument. The draft Bill has a provision to bring 30 lakh NGOs across the country under the ambit of Lokpal but only 60,000 Class I officers and above would come under the Lokpal. Team Anna’s further contention is that the punishment for false complaint is two years imprisonment while the punishment to corrupt officers is only six months under the government version. “In case any complaint is lodged against a public servant, there is provision for a counter case of ‘false complaint’ which will start immediately in the special court but the corrupt officer will get three layers of protection even before a chargesheet can be filed by the Lokpal,” Bhushan told a news channel. Let me state that everyone in this country is suffering corruption of some kind at the hands of people in position of power. The downtrodden, Scheduled Castes, Scheduled Tribes and poor are the worst suffers. The ruling party “Congress”, whenever, it has come to power, has indulged in corruption of unimaginable scales. It would be apt to say that corruption is in its genes. Successive Prime Ministers of this political outfit have been involved in corruption. Without any doubt, the existing regime headed by Dr. Manmohan Singh is most corrupt. With what face few Ministers of this government stops opposition from attacking Dr. Manmohan Singh on this issue? The worst corruption scandals have happened / unearthed right under his nose. How can he feign ignorance of such a situation? As reports reveal, 2G fiasco clearly entangle PMO in corruption. The suave and honest image of PM has been exploited by shrewd politicians in Congress Party to make huge bucks in quick manner in form of kick backs. Same is the case with CWG. Shameless Delhi CM is continuing despite huge bungling of public money. When the party in power decided to initiate a dialogue with Anna Hazare, they should have co-opted the other political parties and so called civil society to cobble together a broader agreement on the issues involved in the Lok Pal Draft Bill of Government. But arrogant attitude of government think tank lead to the present situation. Can government replace the whole bill through amendments? The answer is no because if it happens that way, then the question of application of mind by the Cabinet and policy maker would come to question and Government shall have to eat humble pie. The issue of right and wrong are closely linked to the consciences and moral values and cannot be decided by show of strength by shouting or voting on the floor of the house. In a Democracy, Parliament is sovereign and it represents will of the people. The hysterical situation created by Anna and his associates through inciting public frenzy would lead to some positive decisions is a matter of debate and many questions could be raised on their modus operandi. Such tactics could pave way for wrong decision making for which generations have to repent later on. Democracy is based on principle of Checks and Balances and on the theory of Separation of Power. One ‘Lokpal’ overseeing Legislatures, Executive and Judiciary would become a Monster which will eat everyone. The actions of Legislators within the Legislature or say on the floor of the House should not come under scrutiny at all. The government may try to bring other political parties and Anna’s associate to discussion table and discuss the draft of Lokpal Bill in detail and end this impasse. It appears that think tank in Congress government does not mean business, therefore, it is applying a dilly dally approach or they are trying to impeach the authority and credibility of Dr. Manmohan Singh to prepare grounds to bring in Rahul Gandhi to head the government.